October is National Disability Employment Awareness Month. Today, 70% of people with disabilities are not employed, even though polls show that most of them would prefer to work. Incredibly, this is about the same percentage of unemployed persons since the early 1980’s when I began my work in the field of disabilities. 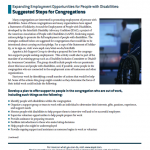 The Interfaith Disability Advocacy Coalition, of which the UUA is a member, in collaboration with the American Association of People with Disabilities, has published a document on ways that congregations can help to expand employment opportunities for people with disabilities. Click on the picture in the upper left corner to be directed to that helpful article. Unemployment is an affront to one’s dignity, self-worth and ability to achieve a satisfactory quality of life. We have to do better for people with disabilities whose dreams of gainful employment are still just that. Thanks for your help. Mark Bernstein is the UUA staff liaison to Equual Access and a Congregational Life Staff with the Central East Regional Group.